The present investigation is related to the frequency of infection and to the gross and microscopic lesions associated to the presence of trichurid worms in 50 ring-necked pheasants (Phasianus colchicus) from backyard flocks in the state of Rio de Janeiro, Brazil. In the investigated birds, the overall infection rate was of 74%, with the presence of Eucoleus perforans with 72% of prevalence and 21.2 of mean intensity, in the esophageal and crop mucosa and rarely in the junction of the proventriculus and esophagus, E. annulatus with 2% and 3 in the crop mucosa, Capillaria phasianina, with 12% and 4.3 in the cecum and small intestine and Baruscapillaria obsignata, for the first time referred in this host, with 2% and 1 in the small intestine. Clinical signs were absent. The gross lesions observed in the crop and esophagus of 14 (38.9%) pheasants parasitized with E. perforans were thickening, small nodules, congestion, and petechial haemorrhages in the mucosa. These birds presented a mean infection of 37.5 and a range of infection of 10-82. The microscopic lesions revealed chronic esophagitis with diffuse inflammatory process in the lamina propria characterized mostly by a mononuclear cell infiltrate and also with the presence of granulocytes. In the case of the parasitism of pheasants with C. phasianina, the gross lesions were absent; microscopic lesions were characterized by chronic typhlitis with mononuclear infiltrate. Gross and microscopic lesions were absent in the pheasants parasitized with E. annulatus and B. obsignata. 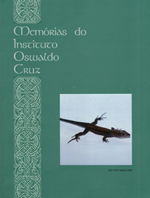 © Copyright 2004 - Instituto Oswaldo Cruz - Fiocruz.